Do we make a real impact reusing materials? We quantified the benefits of our furniture using Life Cycle Assessment (LCA). This kind of analysis is the globally accepted way to quantify environmental impacts, and this is how we as reusers can prove we make a difference. 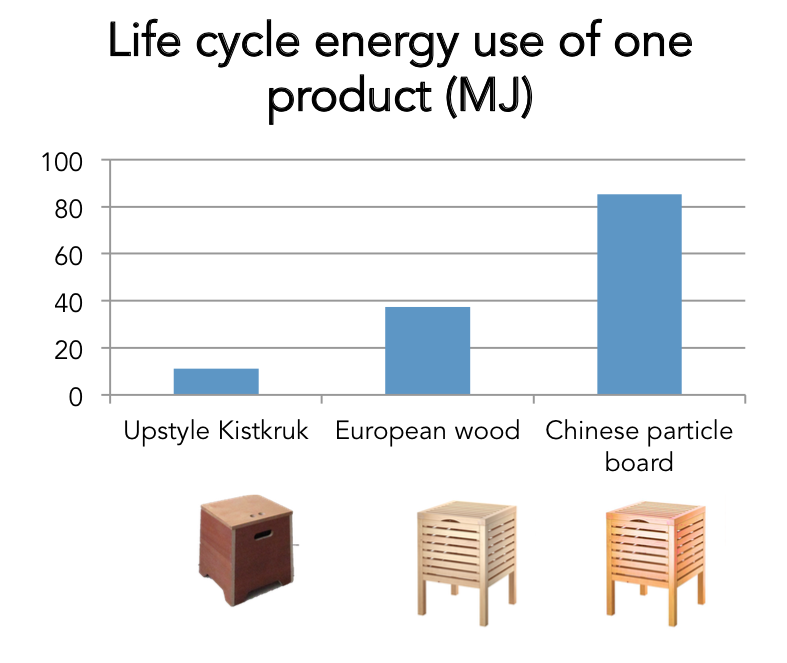 We looked at the energy use (and gains) along the life cycle of a Kistkruk in comparison with a stool mass-produced with first-hand materials. The results surprised us as well: we found that our furniture made from locally sourced old furniture needs 70% to 87% less energy than normal mass produced products. And this even taking into account that the wood we use would have been incinerated for energy recovery if we wouldn’t produce furniture out of it. What does this mean? That if we would make our furniture from all the furniture we discard in our cities, we could furnish 2 to 6 times more houses with the same amount of energy. That’s a lot, if we would have alternatives that save this much energy in every product category in our lives, most of our climate and energy problems would be solved. Because driving consumes so much energy, we strive to use local rest materials rather than fancy reclaimed wood from the other side of the world. But not only that…. we also encourage you to use a bakfiets, public transport or a delivery service when you will buy our furniture, or those of our competitors!